It was 2007. My twins had just been born and I thought, What better time than now to engage in the emotionally trying and logistically fraught act of potty training my two-and-a-half-year-old? Any other time would have been a better time to attempt potty training. Even active labor. So when you ask me what I want for Mother’s Day, I tell you I want just one . . . thousand parenting do-overs. Just a few. Some. 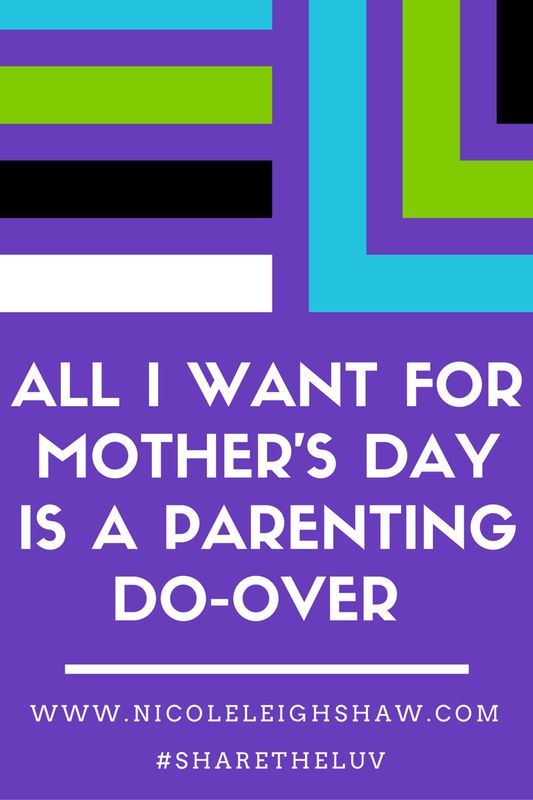 Don’t get me wrong, there have been some great Mother’s Days, even without the do-overs! I’ve eaten food that was lovingly prepared by unwashed hands. I’ve gotten handmade cards at 8:30 in the evening because my husband realized late in the game that I might like a little something from the children to mark this special day. I’ve even gotten boxes of delicious chocolate that were for me, but were eaten by my kids. I really enjoyed licking those empty wrappers. But, really, my favorite Mother’s Day gift is the same each year. Each year talk turns to what it was like to become a mother to each of my kids. We fondly recall their firsts: first steps, first loose tooth, first day of school, first time they slept through the night and I remembered what it was like to feel sane. When we get rolling telling stories about them, we always end up re-telling the funniest memories, which also happen to be the ones where something went terribly awry. For example, once my two-year-old twins cave painted their bedroom closet—with their own poop. Eventually, we get to the story about my oldest hiding around the edge of a building, giggling, while I frantically paced an adjacent parking lot, screaming her name and begging strangers to "Help me find my four-year-old daughter, she's lost!" When we get to that particular story, I realize that what I want most for Mother's Day is a time machine to go right a few parenting wrongs. Or anti-anxiety medication. What else would I do over? I can think of a few (31) parenting moments I wish I could have another crack at. 1. That time I made a diaper out of paper towels and duct tape. 2. Any time I took a three-year-old into a public bathroom. 3. When I made fun of minivans and swore to everyone I knew that I’d never drive one. 4. The time I took the training wheels off my child’s bike and said, “Just keep pedaling! You can do it!” Then I let go and learned that she really couldn’t do it, actually. 5. When we tried an impromptu road trip with toddlers. 6. The time I spent any money at all on Christmas gifts for a child under the age of one. 7. The time I tried to have a talk about the exciting changes in my pre-teen’s body and anyone, even actual birds and bees, could have done a better job. 8. All the times I didn’t nap when the baby was napping. 9. The three hours I spent compiling a list of instructions for my mom because I was leaving the baby with her for 43 minutes. 10. The time I answered the door for the delivery man and didn’t realize my breast was hanging out because I’d just been nursing the baby. 11. Any time I retreated to a toilet to breastfeed my baby because I didn’t want to offend anyone, you know, with the very same breasts they spend hours on the internet looking at. 12. 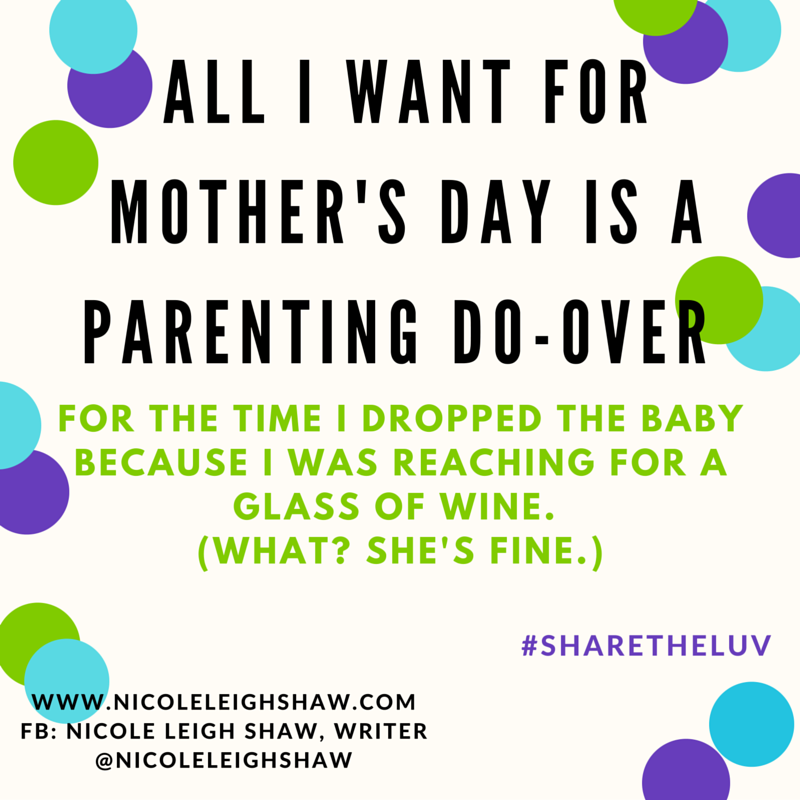 The time I dropped the baby because I was reaching for a glass of wine. 14. The time I said “sh*t” in front of the kids. 16. That time I decided to check on the baby when she was asleep and I accidentally woke her up which was all Opposite Day and then we both cried. 17. 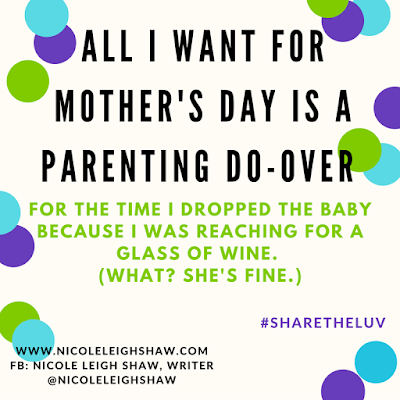 The time I dropped the baby because I was reaching for a glass of wine. 18. Any time I sat through an episode of Caillou. 19. All the times I’ve shown up late to one of my kid’s events. 20. The time I showed up a day early to one of my kid’s events. 21. The hour (or 4) I spent trying to remember how to solve for x. 22. When I spent an obscene amount of money on premium diapers instead of college funds. 23. When we wore matching outfits for the holiday photo and that outfit was reindeer costumes. 24. All the times I forgot to lock the bathroom door when I was in there. 25. The time I tried to cut my own kid’s hair. 26. Any time during my first pregnancy, but before the birth, that I opened my mouth to share a parenting philosophy. 28. When I spent a month trying to hide veggies in everything my kids ate. 29. The time I believed my kids when they promised that if I bought them a pet, they'd take care of it. 30. When I bought a diaper stacker, a wipes warmer, and a changing table without realizing I'd end up keeping the diapers in the closet or a diaper bag, the wipes in the container they came in, and that I'd do most of my diaper changes on the living room floor. 31. Pretty much the entire first year of parenthood except for the first smile, the first giggle, and the first time I went out without the baby wearing clothes I hadn’t slept in. It’s okay, parenting is hard stuff. You’ll make a few mistakes, but the kids will love you anyway and make you handprint Mother's Day cards and convince you to eat their favorite dinner even though it's your special day. But the mistake you don’t have to make is spending your dollars on very expensive diapers. 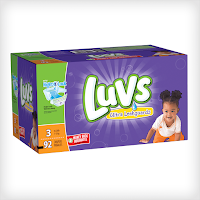 I don’t support Luvs just because they hired me to do it, I support Luvs because it’s actually the brand I used for 3 out of 4 babies and toddlers. Those were the youngest three, because eventually you become less of an idiot and more interested in having enough money to buy diapers and a latte. FINE PRINT AND COUPONS AND CASH REBATES, OH MY! This is a sponsored post. I work for Luvs as an ambassador or social media personality or trained seal—one of those. I write about Luvs and help them spread the news about things like their large, easy-to-use tabs that you can fasten over and over again. (See? Do-overs!) I write about the fact that there’s a money back guarantee if the diapers leak (for real). And I write about COUPONS. Just go to this Sunday's May 1, 2016 newspaper and clip the $2 Luvs coupon or print it from this Web site. 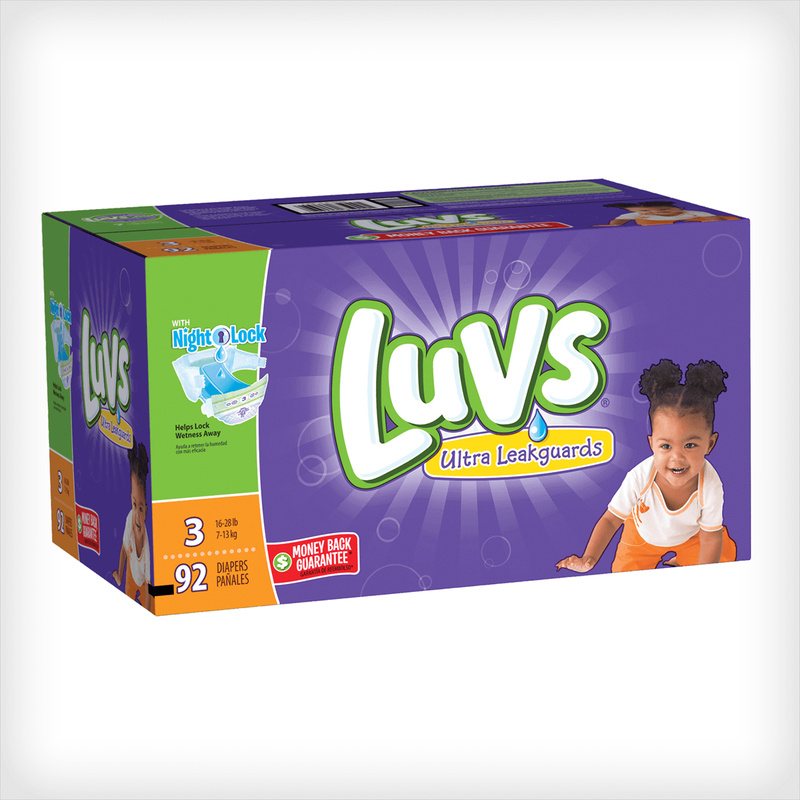 You can also scoop up a $5 cash rebate for Luvs diapers through the free Ibotta app for iOS or Android. You’ll only be able to use that one on 54-count or larger boxes of Luvs diapers, but that’s okay because babies be pooping.